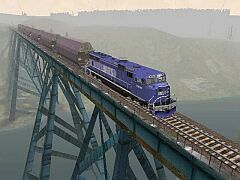 An SD70MAC heading a consist of Boeing freight cars of 777 fuselages waits on the Glacier Park trestle for a clear to proceed. These are a few ideas on changing your field of view when driving in your locos' cabs, doing a helicopter shot (2 and 3 keys), and the other views, particularly the coupler view (6 key) when shunting. It follows a recent article at TrainSim section of the MSN Game Zone. Those familiar with the way in which different focus lengths of cameras results in different views won't need to read this. Now you're probably wondering why we should be bothered with all this information. It's because the camcfg.dat file in the Globals folder under the main MSTS folder contains information about the field of view for the various cam shots (inside the cab, etc.). All the default settings use a field of view of 60 degrees, that is, we're looking through a lens equivalent to a focal length of about 26mm. Bearing in mind that looking through a 35mm camera lens is the same as looking at a scene with the naked eye, looking through a 26mm lens results in the scenery appearing to be further away in a wide-angle view. A focal length greater than 35mm results in a zoom effect, that is, the scene is pushed away from us. The view from the cab is more natural and the coupler view is wide-angled to enable more control when coupling carriages and wagons. The latter is also enhanced if the point of view is changed from above the rolling stock to looking from the side (as a yardman would see things as he walked alongside the loco as it approached the wagon to be coupled). All other fields of view are left with a value of 60. Before carrying out any changes, make a backup copy of your camcfg.dat by copying it to your MSTS backup folder. Remember to use good, old WordPad to edit the camcfg.dat file and save the file as a unicode text document. Now when you're shunting and coupling carriages and wagons, pressing 6 will give you a side view of the approaching wagons and locos. The small changes mentioned above do make a difference to give a more enjoyable MSTS experience.